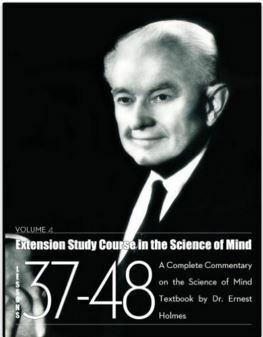 The Extension Study Course is a complete commentary on the Science of Mind Textbook by Dr. Ernest Holmes, himself. It is like having Dr. Holmes take you by the hand and explain the Science of Mind philosophy to you. The Science of Mind Archives’ version includes questions and answers by Dr. Holmes’ close friend and associate, Dr. Reginald Armor. For those who are ready to delve deeper and learn how to apply the teachings of Science of Mind to your daily life, this course is for you! Note! To follow along you will need the 1938 version of the Science of Mind Textbook (“The Definitive Edition” works well). The page numbers in the “Complete Edition” that has both the 1926 and 1938 versions of the Science of Mind textbook will not track. With this lesson you are starting on the last quarter of our course. We feel that this lesson contains some of the most important portions of our whole teaching, bringing into general review the broad foundation upon which this philosophy is built. We should like you to pay particular attention to the article, God Talks to the Heart, for it is out of the deep feeling of your innermost sense of union with God that you give a spiritual mind treatment. Something within you already knows, because that something within you is God. And so in all your work, let the heart lead while the intellect follows, doing the best it can to interpret what the heart feels. Also please note the article on Group Treatment. It is our belief that the time will come when this method of instruction and treatment will lead millions of people into a higher consciousness of good and a greater realization of the Divine Presence. It is a wonderful experience on which we are embarked, proving the supremacy of good over apparent resistance, and proving that God actually is over all, in all, and is all. As you study these remaining lessons, do so with buoyant hope and joyous anticipation, ever while the quiet realization of what you have learned carries you to new heights of spiritual attainment.